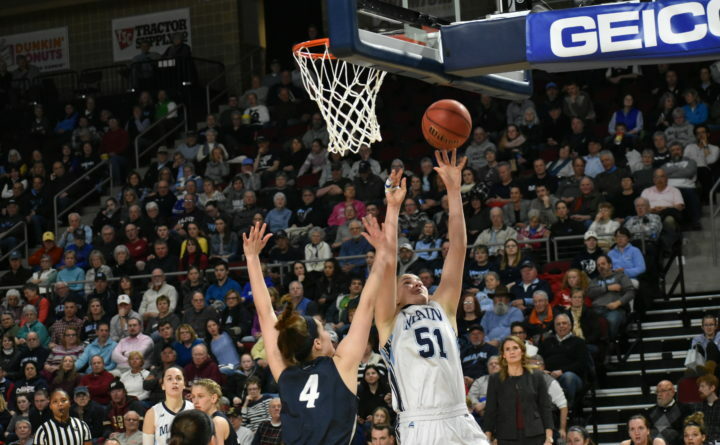 Fanny Wadling (51) of the University of Maine shoots over Ivy Gogolin of New Hampshire during the March 6 America East quarterfinal game at the Cross Insurance Center in Bangor. Wadling will play in Saturday's NCAA tournament game at North Carolina State after missing the first meeting in December with a concussion. It was a different University of Maine women’s basketball team that dropped an 84-46 decision at North Carolina State on Dec. 15. 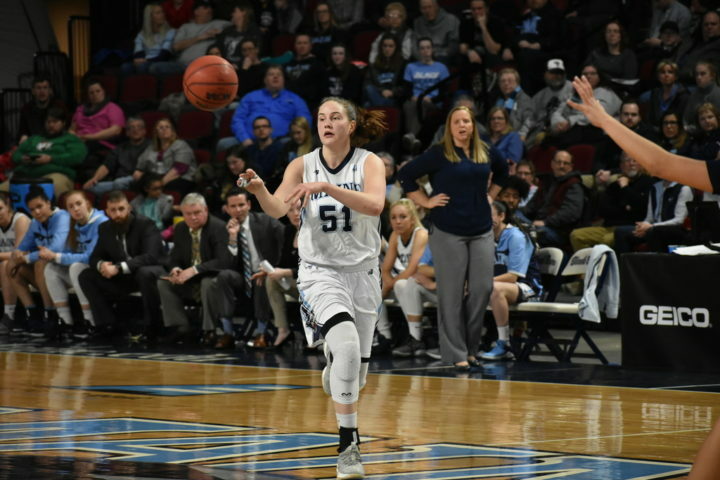 For starters, the Black Bears were without junior forward Fanny Wadling, their leading rebounder, who was dealing with post-concussion symptoms. That helped the Wolfpack outrebound the cold-shooting Black Bears 50-26. Wadling hopes to make a difference Saturday afternoon when No. 14 seed UMaine (25-7) tries to knock off third-seeded and 10th-ranked North Carolina State (26-5) in a 1 p.m. NCAA tournament first-round game at Valvano Arena in Reynolds Coliseum in Raleigh, North Carolina. Wadling, UMaine’s tallest starter at 6-foot-2, is averaging nine rebounds thanks to double-digit performances in six of her past eight games. But the Black Bears will be up against an N.C. State team that ranks 14th in the country in rebound margin at plus-8.8. Fanny Wadling of the University of Maine passes to a teammate while dribbling up the court during the Black Bears' March 6 America East quarterfinal game against New Hampshire at the Cross Insurance Center in Bangor. Wadling will play in Saturday's NCAA tournament game at North Carolina State after missing the first meeting in December with a concussion. Wadling will continue to wear a splint on the pinkie finger on her right hand after she broke it during practice before the Feb. 24 game against Stony Brook. Fortunately, the native of Nacka, Sweden, is left-handed. “I’m even more left-handed now,” Wadling said. UMaine must deal with the likes of Wolfpack 6-5 freshman center Elissa Cunane and 6-1 senior forward DD Rogers. Cunane averaged 21 points and 7.5 rebounds in two Atlantic Coast Conference tournament games and was named to the all-tourney team. Rogers averaged 14.5 points and 8.5 in those games. N.C. State had 35 defensive rebounds to UMaine’s 14 in the previous meeting. UMaine head coach Amy Vachon said part of the reason those numbers were so lopsided is because of the shooting disparity. The Wolfpack shot 56.8 percent from the floor (33-for-58) compared with UMaine’s 27 percent (17-for-63). She noted that Wadling is playing really well of late, which gives the team confidence. One of the few bright spots in the first meeting was the play of UMaine’s reserves, who could play an important role Saturday. Sophomore guard Kelly Fogarty scored a team-high 13 points in 20 minutes, and Carroll, who started in Wadling’s absence, posted six points and blocked two shots. Fogarty, who is averaging 3.7 points in 11.2 minutes per contest, said her performance gives her confidence if she is called upon. Carroll (2.7 ppg, 3.9 rpg, 19.2 mpg) said starting in place of Wadling during her 10-game absence was valuable. “That helped me become more comfortable and confident on the court,” said Carroll, who is from Virginia and will have several family members in Raleigh. “I know we didn’t play our best game, and I know we’ll shoot the ball better than we did the last time,” she said. The other backup who averages double-digit minutes in her appearances is senior guard Maddy McVicar of Calais. She is contributing 3.2 points and 1.3 rebounds in 13.9 minutes per game. Vachon said that trio continues to improve and has been important in UMaine’s success. “They know what their roles are, and they’re always ready,” junior Blanca Millan said. Vachon knows her team is facing a tall task against the Wolfpack and must execute in the areas it did not in the December meeting. “We’re going to have to hit our shots. We didn’t hit them in the first game and it hurt us,” Vachon said. She also stressed the need to mix up their defenses and rebound well. “We’re going to have to keep them off-balance. We can’t just play man-to-man or zone. They’re too good of a team,” Vachon said.